This chart includes the last five significant mayoral contests. These span the past 20 years. Several things are immediately clear. 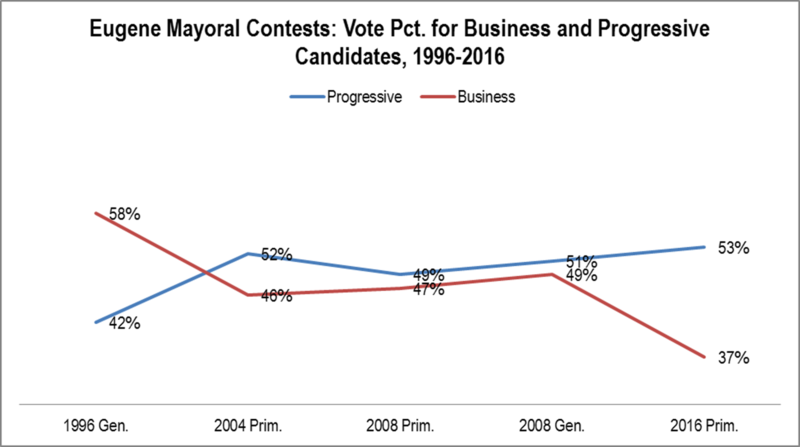 First, after 1996 and before 2016 the Business and Progressive sides were fairly evenly matched. Second, at each end of the time series, however, there were landslides. Torrey beat Weaver and Vinis beat Clark. Both wins were by more than 15 points. Torrey’s win was slightly bigger. The two landslides, though, are not exactly comparable. Torrey vs. Weaver was head to head. Clark vs. Vinis included three minor candidates. 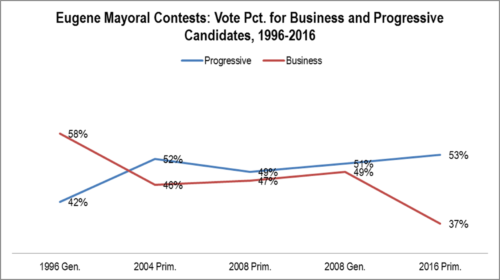 Finally, while Vinis’ percentage was only slightly above the norm for Progressive candidates, Clark’s percentage was far below that for Business candidates. Two different conclusions are reasonable: 1. Eugene has become far more progressive since 2008. The minor candidates in 2016 were all progressive and they could have taken votes meant for Vinis. 2. For some reason, the Clark campaign significantly underperformed. At this point the data supports conclusion #2. There are many reasons for this. Among these are that Pat Farr had little problem winning the North Eugene County Commissioner seat against a strong opponent. His numbers were far above Bobby Green’s in 2008 while Mike Clark’s were far below Jim Torrey’s in 2008. The polling over the past decade has been pretty consistent and shows no big changes in the Eugene electorate. Finally, polling for the mayoral race closely matched the actual result. This will be covered in the next post. METHODOLOGY: The totals do not always equal 100% due to minor candidates. The mayoral contests included were: 1996 Gen.: Jim Torrey (Business) vs. Jim Weaver (Progressive). 2004 Prim. : Nancy Nathanson (Business) vs. Kitty Piercy (Progressive). There were some minor candidates. 2008 Prim. : Jim Torrey (Business) vs. Kitty Piercy (Progressive). There were some minor candidates. 2008 Gen.: Jim Torrey (Business) vs. Kitty Piercy (Progressive). 2016 Prim. : Mike Clark (Business) vs. Lucy Vinis (Progressive). There were some minor candidates. There were no minor candidates running in either of the general elections considered due to Eugene City Charter requirements.